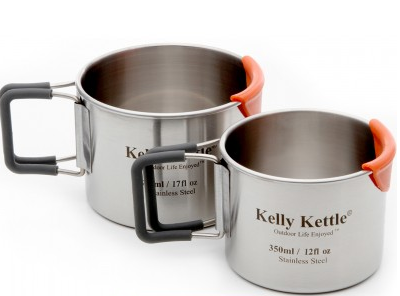 We've sold the world-famous Kelly Kettles for years, these stainless Camp Mugs are a perfect accessory or stand-alone boat-camping gear. 2 x High quality single walled Camping Cups (350 & 500ml) Features Include: Silicone coated foldable handles for comfort / CooLip™ feature to protect lips from burning / measurements on inside of cup / Polished internally for easy cleaning / Dishwasher safe. Packing: Small cup packs inside large cup - and both pack inside the large Cook Pot, which packs inside our new Hobo Stove™ which packs inside the fire base of the 'Base Camp or 'Scout' Kettles. 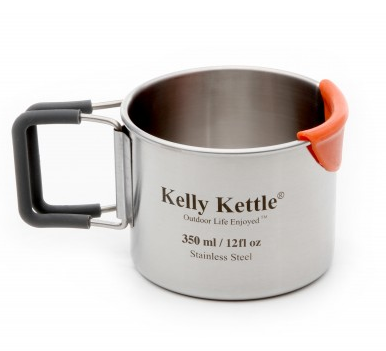 Please note: The 350ml Cup will fit inside the smaller 'Trekker' Cook set (like SCA sells), but the larger 500ml cup is too large to fit. Copyright © 2007-2019 Small Craft Advisor. All Rights Reserved.